The First Sangye Nyenpa Rinpoche, Drubchen Tashi Paljor, was born in 1457 in Nyen Phodrang, an area in the Denma region of Dege, East Tibet. He was five years old when he heard the name “Karmapa” and was overcome by a deep devotion that spontaneously arose within him. The following year he met the Seventh Karmapa Chödrak Gyamtso, who named the young boy Tashi Paljor. At the age of eight, he received the novice vows, empowerments, and profound instructions from the Karmapa. He would later also receive the full ordination from him. He set his mind to the diligent study of both outer and inner sciences under Bengar Jampal Zangpo and the First Gyaltsap Paljor Döndrub Rinpoche, who guided him through the three stages of listening, contemplating and meditating. For seven years he was never separate from his Lama, the Gyalwa Karmapa. Having received the full transmission, the Karmapa instructed him to practice at Gampo Nenang for three years, at Tsurphu for two years, at Palpung for two years, and in Thanglha Mountains in North-East Tibet for one year. Tashi Paljor fulfilled his Guru’s wishes and is said to have been solely nourished by his control over his subtle body, through his practice of bar lung, for the entire eight years. He then spent another five years meditating in seclusion on the Tsenmodo Island in Namtso, the largest lake in North-East Tibet. This was the same place that his Lama, Bengar Jampal Zangpo, had meditated for eighteen years, before composing the Dorje Chang Thungma. In this way, Tashi Paljor followed the example of Jetsun Milarepa and Bengar Jampal Zangpo and practiced meditation uninterruptedly from the age of twenty-three to forty-three. 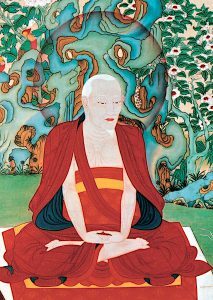 After twenty years in solitary retreat, he attained full realisation and became known as the first Sangye Nyenpa Rinpoche. He then returned to his homeland, Denma. One day he was staying on the fourth floor of a house when a severe earthquake occurred, destroying every building in the area, killing and burying many people under the rubble. Tashi Paljor however was witnessed miraculously flying up into the air, thus remaining unharmed. It is through this that he became known as Drubchen Tashi Paljor, the great Mahasiddha Tashi Paljor. It was prophesised by renowned Lamas and Dakinis that he would establish a great Dharma Palace in his native homeland, and accordingly, Tashi Paljor laid the foundation for Changchub Chökhor Ling Monastery at Denkhog in the Land of Denma. His Holiness the Eighth Gyalwa Karmapa, Mikyö Dorje, was instructed in a vision by Mahakala to take Mahasiddha Tashi Paljor as his root Lama. As such, Sangye Nyenpa transmitted the complete Karma Kagyu empowerments and profound instructions to Mikyö Dorje. After having brought immeasurable benefit to this world, Drubchen Sangye Nyenpa Rinpoche passed into Parinirvana at the age of sixty-eight in the year 1525.